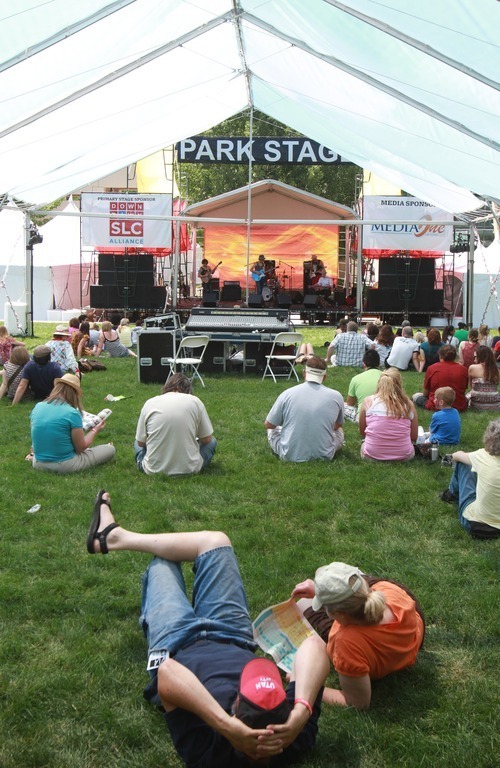 Utah Arts Festival • Stages aren't only place where music abounds. Margaret Distler | The Salt Lake Tribune Nhi Doan and Tessie Pham paint one of the 100 total squares part of artist Mason Fetze Al Hartmann | The Salt Lake Tribune Folks check out a "yarn bombed" mini cooper that was entirely covered with knitted yarns as Rick Egan | The Salt Lake Tribune Mason Chivers, 7, Herriman, toots a trombone at the Instrument Petting Zoo. Rick Egan | The Salt Lake Tribune Gabriella Davis tries out the violin at the "Instrument Petting Zoo" sponsored by Summerhays Rick Egan | The Salt Lake Tribune Emilie Sjoblom paints a raindrop at a booth at the toddler zone. Rick Egan | The Salt Lake Tribune Antonio Cruz Martinez is known as "Electronic Battleship" on the stage. 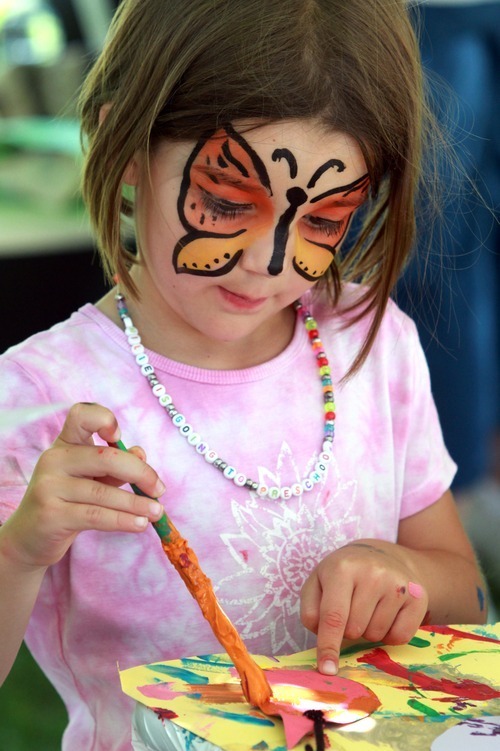 Rick Egan | The Salt Lake Tribune Emilie Sjoblom had her face painted in the toddler zone. Rick Egan | The Salt Lake Tribune DJ Antonio Cruz Martinez works his magic. 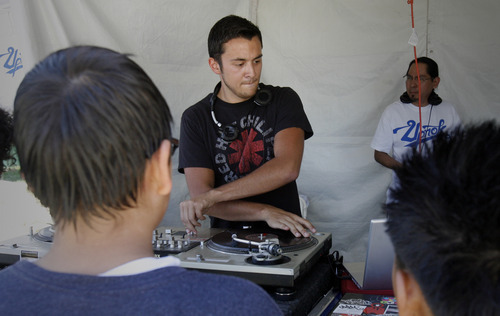 Rick Egan | The Salt Lake Tribune Antonio Cruz Martinez, of Ogden, works as a disc jockey in the Urban Arts zone. Rick Egan | The Salt Lake Tribune Festival-goers relax in the shade as they listen to the band American Shakes play on the Park Rick Egan | The Salt Lake Tribune Crowds brave the midday sun at the Utah Arts Festival. 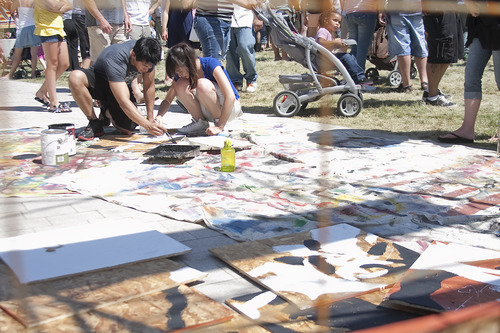 Margaret Distler | The Salt Lake Tribune Nhi Doan and Tessie Pham paint one of the 100 total squares part of artist Mason Fetzer's community collaboration mural at the Utah Arts Festival on Saturday, June 25, 2011. Fetzer divided a picture into 100 pieces, which festival participants are painting onto wooden squares to create the 20x20 foot mural. While this is not Fetzer's first collaboration mural, it is his largest, with the previous largest one being 7x7 feet. 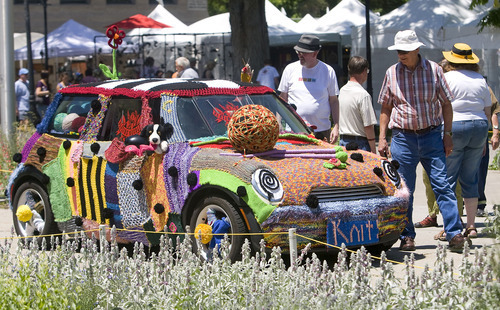 Al Hartmann | The Salt Lake Tribune Folks check out a "yarn bombed" mini cooper that was entirely covered with knitted yarns as the Utah Arts Festival opened Thursday in Salt Lake City. It was knit by patrons of Blazing Needles, a knitting shop in Salt Lake City. 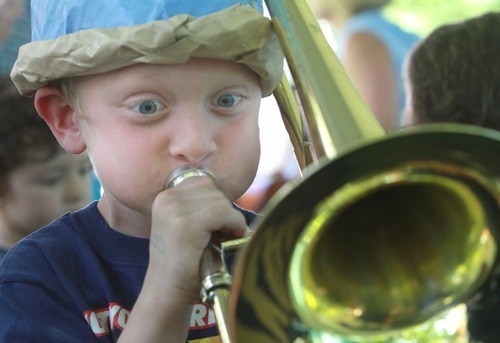 Rick Egan | The Salt Lake Tribune Mason Chivers, 7, Herriman, toots a trombone at the Instrument Petting Zoo. 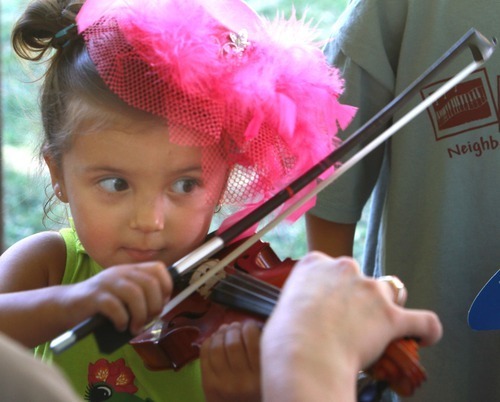 Rick Egan | The Salt Lake Tribune Gabriella Davis tries out the violin at the "Instrument Petting Zoo" sponsored by Summerhays Music Center. Rick Egan | The Salt Lake Tribune Emilie Sjoblom paints a raindrop at a booth at the toddler zone. Rick Egan | The Salt Lake Tribune Antonio Cruz Martinez is known as "Electronic Battleship" on the stage. 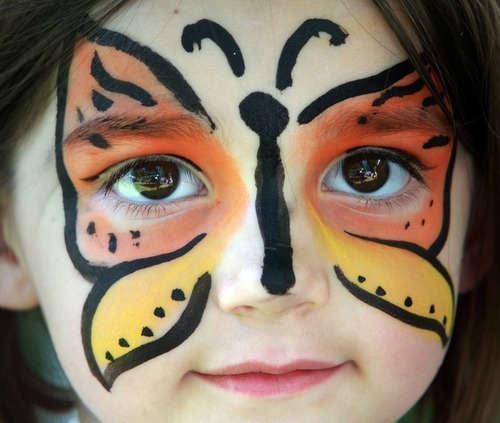 Rick Egan | The Salt Lake Tribune Emilie Sjoblom had her face painted in the toddler zone. Rick Egan | The Salt Lake Tribune DJ Antonio Cruz Martinez works his magic. 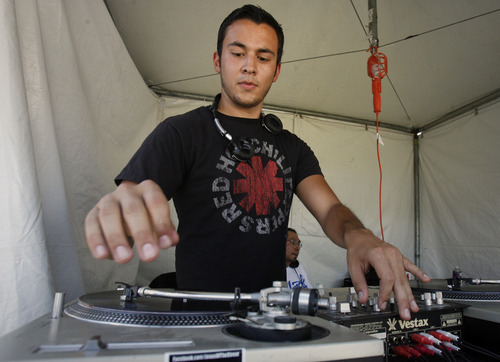 Rick Egan | The Salt Lake Tribune Antonio Cruz Martinez, of Ogden, works as a disc jockey in the Urban Arts zone. Rick Egan | The Salt Lake Tribune Festival-goers relax in the shade as they listen to the band American Shakes play on the Park Stage. 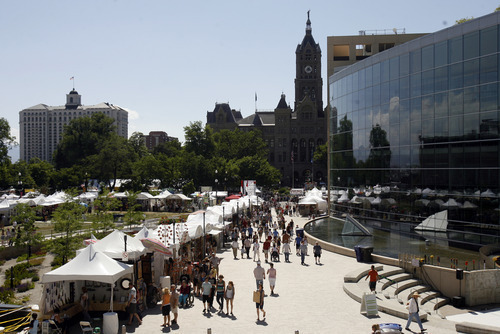 Rick Egan | The Salt Lake Tribune Crowds brave the midday sun at the Utah Arts Festival. Halle Allen approached the alto saxophone with all the bravery a 3-year-old girl could muster. "Do you have someone to hold your gum?" Summerhays Music's Bruce Woodward asked Halle. With her eyes still transfixed on the sanitized mouthpiece of the instrument, she took the gum out of her mouth and placed it into her mother's palm. Halle wrapped her lips around the horn. She blew gently. Nothing came out. Woodward told her to imagine blowing out the candles on a birthday cake. Halle blew again, but this time, she forced a powerful burst through the mouthpiece, causing the resonator to vibrate, and a deep, brassy note came out of the U-shaped horn. As the Bountiful child smiled with satisfaction, Woodward said to a bystander, "It's a lot of fun to see the light go on." The scene at Summerhays Music Center's "Instrument Petting Zoo" inside the Art Yard was repeated from noon to 9 p.m. Friday, the second day of the Utah Arts Festival. Children such as Halle and her 5-year-old brother, Carter, proved that music could be found all around the festival, not just on the six stages positioned around Library Square and the City Hall. More music could be found in the Urban Arts area, near the festival's east entrance. A booth sponsored by Salt Lake City record store Uprok featured disc jockeys from around Utah, who were spinning vinyl platters, creating their own art with turntables, computers and mixers. Sipping Pabst Blue Ribbon out of a paper cup, Ogden DJ Antonio Cruz Martinez  perhaps better-known as Electronic Battleship, his stage name  mashed up The Rolling Stones, The Bee Gees and Naughty by Nature while wide-eyed youths looked on. "I think you can find art in anything," Martinez said during a break. "DJ'ing at the Arts Festival is entertaining and educating. We're pulling people in. I hope people will ask questions." 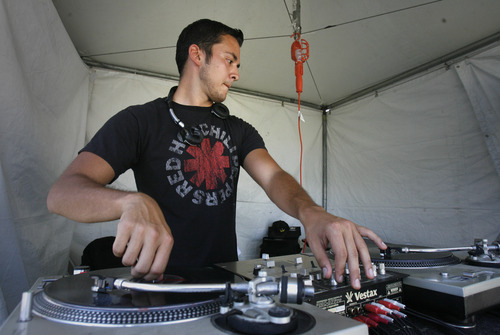 Chase Jensen, owner of Uprok  and perhaps better known by his stage name, Street Jesus  said DJs would be spinning throughout the weekend, and he even invited break dancers to come Saturday. Eating a bratwurst with sauerkraut and enough mustard to make French's jealous, Jensen was selling $5 cans of spray paint to anyone who wanted to contribute their own legal vandalism of a 48-foot-long, 8-foot-high plywood wall near the DJs. The sausage, he said, was to make sure he didn't get too intoxicated, since he'd been drinking since noon the previous day. A decidedly quieter, but no less musical, experience was had inside a shaded booth near the Big Mouth Stage, where Johnie Nicholson, of Caldwell, Idaho, was selling handmade dulcimers, harps and psalteries, an ancient, stringed instrument. He eagerly entertained questions about the number of strings on a dulcimer (four or six), what wood he uses to construct them (generally, cherry, sapele mahogany, walnut, or padauk), and how long it takes him to craft them (between 22 to 26 hours each). As he tuned a dulcimer  he has to do so three times a day because of the heat  Nicholson regaled visitors with stories about Johnny Cash's mother-in-law, Maybelle Carter ("She played the snot out of the dulcimer"), and why parsley, sage, rosemary and thyme are referenced in the classic song, "Scarborough Fair." If you want to know the answer, Nicholson will be happy to tell you, right there inside Booth 132. Questions are music to his ears. When • Saturday and Sunday; noon to 11 p.m. Admission • Adults, $10. Kids 12 and under get in free. Seniors, $5.